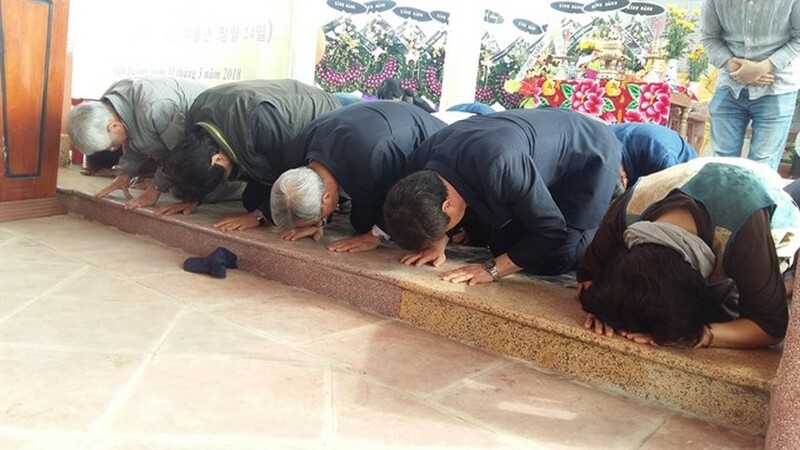 The president of the Korean-Vietnamese Peace Foundation, Kang U-Il, gave an emotional speech at an event marking 50 years since a massacre committed by South Korean soldiers in Ha My Tay Village, in the central province of Quang Nam, on Sunday. 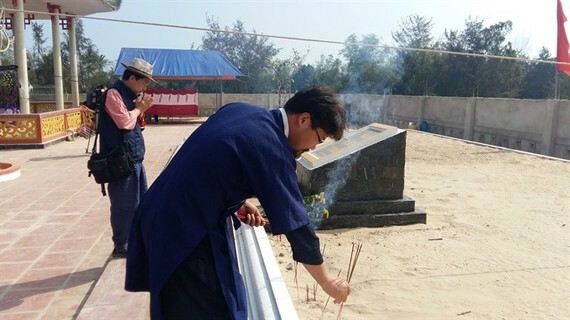 A group of 41 members from the foundation, a member of the Korean National Assembly, Korean writers, organisations, local residents and relatives of victims attended a ceremony and visited the monument dedicated to the massacre in the village. The killings occurred on the 24th of the first lunar month, 1968, in Ha My Village, when South Korean soldiers attacked and killed 135 unarmed civilians including the elderly and new born babies. The monument records the oldest victim as being 88 years old, while the youngest was just a few months. “The massacre happened 50 years ago and Vietnamese people have had the chance to heal their wounds. Many Korean people still do not know the truth of the massacre in the village and central Vietnam. Our hearts break when recalling the killings of Ha My villagers 50 years ago,” Kang U-Il said. Il, who is a Catholic priest, said he and members of the foundation will tell all Korean people the truth of the massacre, and call for an apology from the Korean people to Vietnam and villagers of Ha My. Kim Hyun Kwon, a member of the Korea National Assembly, also expressed his emotions when he joined the commemoration for the first time. “We were anxious and fearful with thought of facing the true story of the massacre. But we want to bravely say ‘sorry’ to the Vietnamese people and victims of Ha My for the killing,” Kim told the media (through an interpreter) in an interview at the ceremony. “I think that the Korean Government should issue an official apology to the Vietnamese people, and they (Korean Government) need to come to victims of the massacre and say ‘sorry’ to them,” he said. Kim said he had spent a year preparing and arranging to visit the village. He said that as a member of the national assembly of Korea, he would call on the Korean Government to apologise to the Vietnamese people. He said many Korean people asked me to send their apologies to the Vietnamese people before visiting Vietnam. Twenty-six wreaths from Korean organisations and individuals, as well as veteran Jeong Gyu Tae, were sent to commemorate the massacre. Hoang Thị Thu, 86, a rare survivor of the massacre recalled how she and her two children (one boy and one girl) were attacked by Korean soldiers. Thu’s left leg was injured by shrapnel from a grenade launched by Korean soldiers during the mass killing on that day. “It was a bloody day. A peaceful village was shaken by explosions, gunfire and frightened screams. 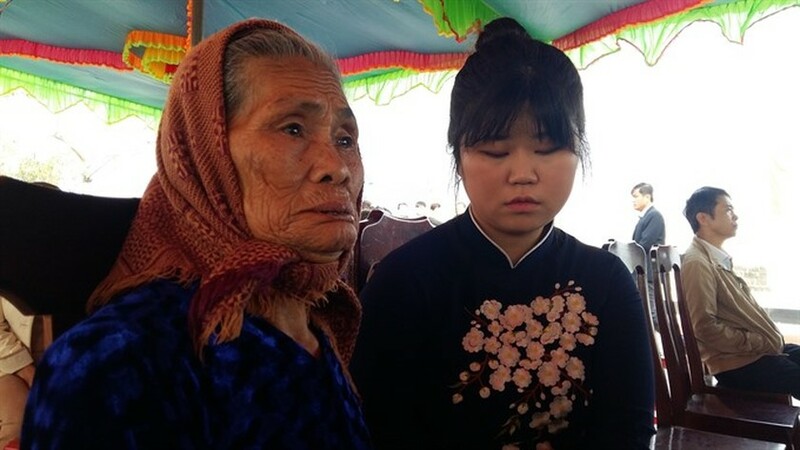 Many villagers were still celebrating after Tet (Lunar New Year) holiday, and they gathered at relatives’ houses, but it’s really a devastating morning for all of us,” Thu recalled in tears. Nguyen Coi, 74, who managed to escape the massacre by hiding in a tunnel, recalled he heard gunfire and the screams of villagers. “I could hear gunfire and explosions very clearly from the tunnel. I could not leave my shelter to save relatives as I would have been killed by gunfire,” Cọi recalled. He said he left the tunnel to find his mother and young brother and sister when everything was quiet later in the evening. “My mother, my younger brother (seven years old) and aunt were found dead, while my younger sister, Nguyen Thi Thanh (11 years old) was seriously wounded,” the old man said. Thanh, who is now 61, managed to recover from her injuries. Thanh was invited by the Korean-Vietnamese Peace Foundation to talk as a victim of the massacre in Korea this April. An Geon-mo, who joined the commemoration, said his older brother joined the war in Vietnam as a soldier stationed in HCM City. “He told me that a group of Korean soldiers (who took part in the massacre) had talked about it. They (Korean soldiers) said they had killed many Vietnamese, but were not sure if they were Vietnamese soldiers or civilians,” An Geon-mo said. Yeo Eun-jong, who is a university graduate, said she has visited Vietnam three times, and learned about the massacre during her trips. “I did not know about the killings by Korean soldiers in Vietnam, but I paid more visits to join the commemorations in central Vietnam. I will tell the truth of the killings to Korean people,” Yeo said. The Korean-Vietnamese Peace Foundation, which was established in 1999, aimed to begin a ‘Sorry to Vietnamese people’ campaign among Koreans, and ask for an official apology. Thousands of people were killed in a series of massacres by Korean soldiers during the war in central provinces of Vietnam between 1966 and 1971. In 2015, the Korean-Vietnamese Peace Foundation donated 52 items and the ‘Vietnam Pieta’ statue to Da Nang City’s museum. The statue commemorated 41 years since the end of the Vietnam War, and was created to call on the South Korean government to take responsibility for massacres of Vietnamese civilians by South Korean troops during the American War in Vietnam.